We share (sometimes overshare) our lives on social media so much that it has become a way of life for many online users. Sure, sometimes people go overboard with the wedding photos, baby photos, pet photos, food photos, travel photos etc and while some of us might gripe about it, almost everything someone does is another user’s pet peeve. An alternative to a photo album full of the same topic is to turn it into one single video. Now that may be more towards today’s video-loving public. But who has the time to record a full video then add music and narration to a simple social share? Nobody. Unless of course you use Pearl, an iOS app that lets you do all that to your favorite videos ridiculously easily. Let’s check out the app: Pearl. In June 2016, developer, Voicekick, Inc released Pearl really powerful photo-editing, video-making tool to the app store. 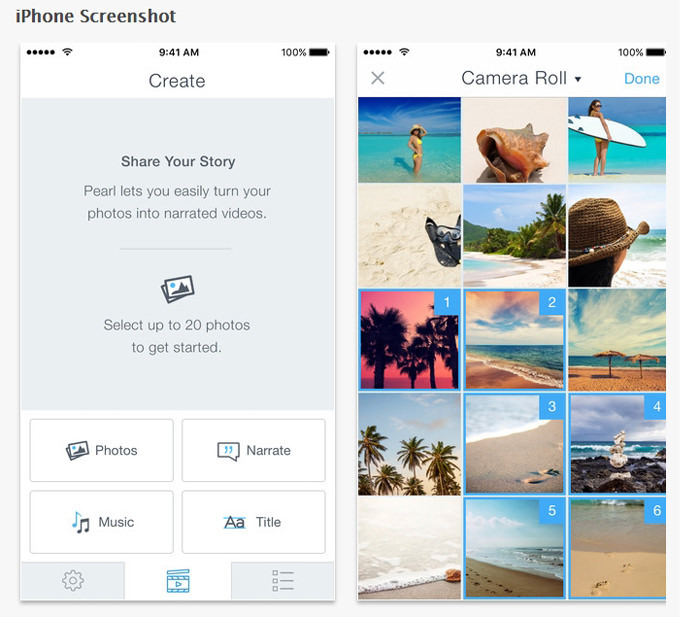 Pearl lets you transform photos into a motion picture or slideshow easily. This lets you merge all your photos of your wedding, your family gathering, your child’s first birthday, or a proposal, into a single video, that can be easily shared on your favorite social network sites. 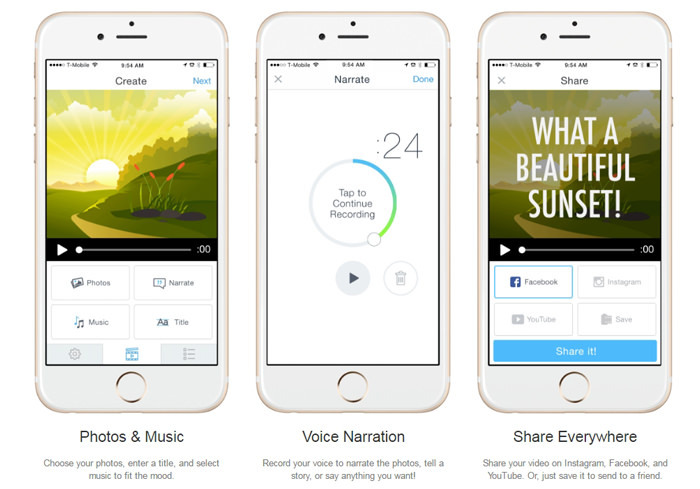 There has been a lot of similar apps in the market, but Pearl is special in the sense that, aside from adding music, you can also record or dub your own voice to create narration for your video. It’s an awesome way to personalize your video, right? Pearl is super easy to use. Start by picking the photos you want to include in your video. Pearl doesn’t limit how many pictures you want to use, but note that the more pictures you include, the heavier your file will be. Pearl works with JPG, JPEG and PNG photos. After processing, the video file will be in MP4. When you’re done, give your collection a title. Next up is the process of beautifying your video. For this, you can add music, narrate the video. With the photos, you can reorder them, zoom and adjust the focus of the photo, choose the orientation (landscape or portrait) and preview it before processing it into video form. One great thing about Pearl is that it has already prepared a lot of music for different ambience: happy, sad, cheerful and many other choices. If none of them fit, use your own choice of music. You just need to store it in your phone library for easy retrieval. And lastly, if you are done with the editing process, you are a click away from sharing it with your friends. Pearl lets you share the video on major social networks, such as Instagram, Facebook, Youtube or Twitter or if you want to keep it personal, by email or text message. Pearl is perfect for medium and small businesses that want to give their product launches a push on social media. Highlight your restaurant’s menu, beautiful cake offerings in your bakery or a showcase of your arts and crafts talent. Even if it is for a secondhand trade, the video could make it much easier for you to let go of that stroller your child cannot fit into anymore. Alternatively, you can make a video of all your travel photos, create wedding proposal videos, unleash video invitations for a life event, share wedding ceremony videos, or announce family events like a pregnancy or the arrival of the new bundle of joy. With Pearl, the world’s your oyster (get it?). As of now, Pearl is only available for iOS/iPhone, but there is no telling that the developer will also develop the same thing for Android later on. You can download Pearl for free via the App Store. But as you may already guessed, the free version will leave Pearl logo in your video. The ad-free version is $1.99.